Celebrate Summer and Win a $50 Disney Gift Card! We are officially celebrating summer here at Mickey Fix with cool stuff like this Stitch Backpack and Death Star Beach Ball! 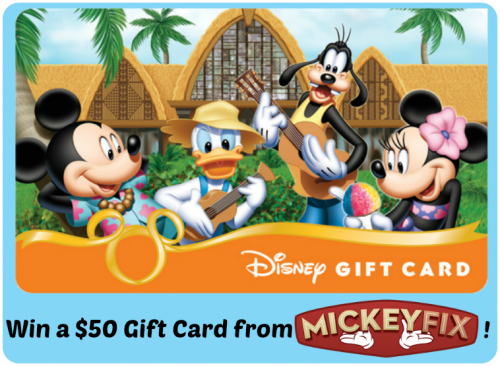 We want to keep the good times rolling by giving away a $50 Disney Gift Card! Read on below for how to enter! The giveaway will end on July 18th, 2017 at 11:59 pm. The prize will be provided by Mickey Fix. We will confirm that you are a subscriber of the Mickey Fix newsletter. Mickey Fix is not affiliated with the Walt Disney Company or its subsidiaries. United States only. I visited your page on Facebook! Subscribed and Love info ! Follow on Twitter. Thank you! I am a subscriber ???? Glad to be here! I subscribed! Long-time subscriber. Love your newsletters! Love your Mickey Fix suggestions! Just subscribed to the newsletter!! Subscribed to newsletter and liked on FB! I subscribed to your newsletter and looking forward to all the information you will provide. It will be helpful on the trip I have planned in February 2018. I am a FB follower. Subscribed! This would help me get my 7year old to Disney!! Subscribed for years and love it!!! Been a subscriber for quite a while now!! I follow on FaceBook!thank you! I love Mickey Fix emails and on Facebook! Already a subscriber to Mickey Fix! Visited FB and left a comment—love the USA castle photo! I like MickeyFix on Facebook. Already a dedicated subscriber thru e mail and Facebook ! This is so nice! Thank you for the chance! Checked out the FB page! I follow your facebook page. thank you. I’ liked your Facebook page! I am now subscribed to your newsletter! I have subscribed to your newsletter! can’t wait to see what you have to send me for Disney!! I subscribed to your newsletter!! I am also following you and liked your page on Facebook! I have liked Mickey Fix on facebook! I subscribed, visited & liked on Facebook, and followed on Twitter! Visited FB and liked. Thanks for the chances! I always enjoy getting my Mickey Fix newsletter in my inbox! Thank you! I subscribed. Just signed up for the newsletter. Love Disney!!!! I’m already a subscriber! Could definitely use the gift card! Long time subscriber. Hope I win !! Already subscribed to the newsletter-love it! Also follow on Facebook ???? Also follow on twitter-thanks for doing this contest again! Already a newsletter subscriber and follow on Facebook. Commented on the post. Thanks for the chance. ºoº Mickey Fix Newsletter Subscription ~ (re)confirmed! I subscribed and confirmed my subscription to the Mickey Fix Newsletter. I visited and “Liked” your FB page. I love the Mickey and Goofy dinner plates! Visited on Facebook! Already liked and following! Been subscribed to the newsletter. I love it! Liked and followed on facebook for a long time. I am a subscriber !! I like you on Facebook and visited. Have loved receiving the MickeyFix newsletter for awhile! I just subscribed to the Mickey Fix newsletter. I’m a long time subscriber to the Mickey Fix on Facebook. I’m a long time follower of Mickey Fix on Twitter. I just visited your fb page, and I am also a follower! I am a Mickey Fix twitter follower!! I follow Mickeyfix on Facebook also! Planning a second vacation and would love to win the gift card! I’m already a Twitter follower! I visited your Facebook page and do everyday! I already subscribe to your newsletter!!! I visit your Facebook page at least once a day!!! Already a subscriber of all of your social media. I subscribed to the email! Facebook and just subscribed to emails. Thank you!! I am already signed up for the Mickey Fix newsletter. Visited Mickey Fix on facebook just now. However had already been there this morning as that is where I learned of this contest. I already follow Mickey Fix on FB and learned about the contest on your site today. I visited on Facebook too! I love getting your newsletter! I subscribed and I follow your Facebook! I follow you on all social media and get your newsletter. I signed up!!! Pick me! Already subscribed and I follow your Facebook! I also follow on twitter, thanks for the chance! I already subscribe and follow on Facebook. Thanks for the chance of winning! !